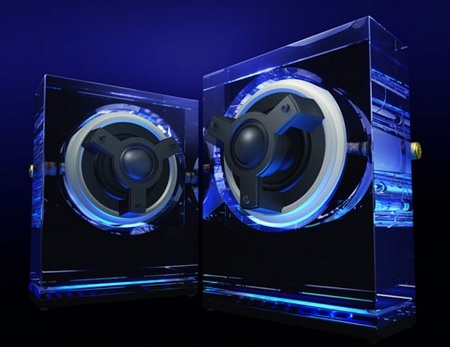 Most speakers you can buy are basically made out of plastic. In most cases we are talking about a speaker that does not attract us. There are only a few out there that are really special. One of them is Kenwood SP0001, a speaker system that is made out of glass. To make everything really simple, this system is really attractive. It would be perfect in the home of every single person that loves cool gadgets. The Kenwood SP0001 comes in 2 versions: one with extra LED lights and the other without them. Unfortunately there is one big downside. Even if these speakers are not really powerful (just 10 W per each speaker), the Kenwood SP0001 costs a nifty $1,000. HMMM, that is a little too much for us but considering the fact that you will mostly find it in Japan, it might be successful.